Should Validation and Verification be Separated Strictly? Verification and validation are methods with which computer simulations are tested. While many practitioners draw a clear line between verification and validation and demand that the former precedes the latter, some philosophers have suggested that the distinction has been over-exaggerated. This chapter clarifies the relationship between verification and validation. Regarding the latter, validation of the conceptual and of the computational model are distinguished. I argue that, as a method, verification is clearly different from validation of either of the models. However, the methods are related to each other as follows: If we allow that the validation of the computational model need not include the comparison between simulation output and measured data, then the computational model may be validated by validating the conceptual model independently and by verifying the simulation with respect to it. This is often not realistic, however, because, in most cases, the conceptual model cannot be validated independently from the simulation. In such cases, the computational model is verified with the aim to use it as an appropriate substitute for the conceptual model. Then simulation output is compared to measured data to validate both the computational and the conceptual model. I analyze the underlying inferences and argue that they require some prior confidence (i) in the conceptual model and (ii) in verification. 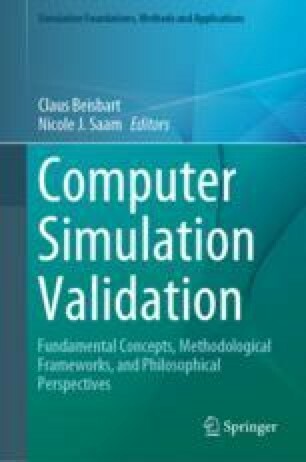 This suggests that verification precede validation that proceeds via a comparison between simulation output and measured data. Recent arguments to the effect that the distinction between verification and validation is not clear-cut do not refute these results, or so I argue against philosopher E. Winsberg. I thank David Murray-Smith and Nicole J. Saam for useful comments. Winsberg, E. (2018a). Computer simulations in science. In E. N. Zalta, (Ed. ), The Stanford Encyclopedia of Philosophy (Summer 2018 Edition). https://plato.stanford.edu/archives/sum2018/entries/simulations-science/.